An ambitious group of Hillsboro middle schoolers recently celebrated accomplishing a huge goal. They had originally hoped to raise $1,000 by the end of the school year to provide a water well for residents of Sudan. Instead, they reached that goal half way through the year. To recap the initial story we reported on a few months ago, sixth graders are required to read a book called A Long Walk to Water, written by Linda Sue Park and based on a true story. It begins as two stories, told in alternating sections, about two 11-year-olds in Sudan, a girl in 2008 and a boy in 1985. The boy, Salva Dut, becomes one of the refugees of Sudan who covers the African continent on foot as they search for their families and for a safe place to stay. One student in particular, Zaylee Werth, could not get it out of her head. She decided that she and her peers needed to do something about it. “We read the book last year in Mrs. Cassidy’s class. We had to research it, and I learned so much about Salva. He had a website and on it I found the Iron Giraffe Challenge. 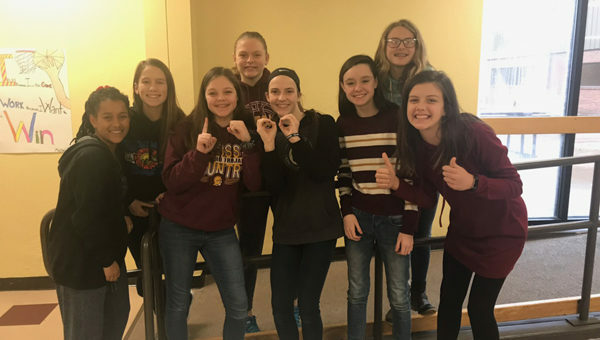 I looked into that and realized that we could actually do it,” said Student Coordinator Zaylee Werth, seventh grade. The challenge was designed by Water for South Sudan, which is an organization founded by Dut and it encourages schools to raise $1000 or more to help ultimately raise a total of $200,000 to provide clean water wells for South Sudan. The students organized a few fundraisers including a bake sale, working concessions and selling bottled water. But for Werth, that wasn’t enough. Thanks to the family contribution of over $800, they total has now reached $1,077. “So now we are going for $2,000,” said Werth. In order to reach the goal, the students are now selling t-shirts. “They are only $10 and are maroon so anyone can buy them and wear them. We all need more maroon shirts to wear to games and events,” said teacher and sponsor Tamara Cassidy. “I think we will be able to reach our goal of $2,000 with the t-shirts. It’s pretty amazing how much we were already able to raise. It’s good to know we can have a voice as kids,” said Werth. The t-shirts can be ordered through the school. They are $10 for sizes youth small to adult XL and $12 for 2XL-3XL. Monetary donations can also be sent to the school or dropped off.